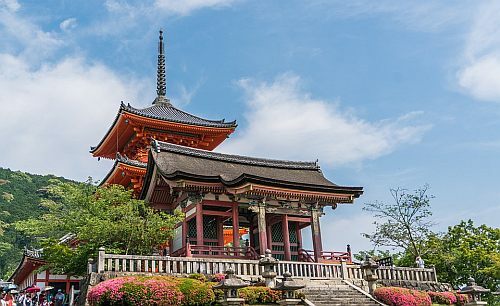 Japan Airlines has dropped the price of a few flights in December 2019 and February 2020 from Edmonton to Osaka, Japan down to between $637 and $675 CAD roundtrip including taxes. There are also some flights in September and October 2019 for $637 to $746 roundtrip. The flights have 2 stops each way, in Vancouver and Tokyo. The flights are in and out of Osaka's Itami (ITM) airport. From Osaka, it's a 26 minute train ride ($17) to the beautiful city of Kyoto if you use the special rapid trains on the JR Kyoto Line. Japan Airlines is a very good airline (5 star rating with Skytrax). TIP: When your search finishes on Kayak, you may want to click on 'Best'. 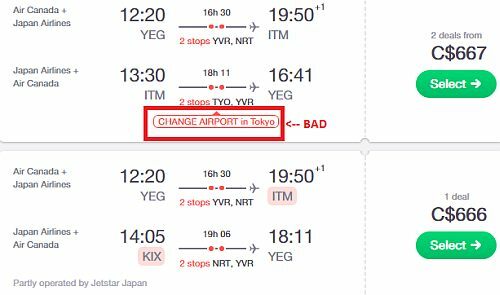 NOTE: Once your Skyscanner search is completed, be sure to avoid the flights that require an 'airport change' (flights with airport changes involve you transporting yourself from one Tokyo airport to the other to make your connection, which you do not want to do). They make it pretty obvious as to which flights have an airport change... (see screenshot below). edmonton, yeg, flight deals, asia, east asia, japan, osaka, itm and japan airlines. Head to the YEG Deals Alerts Page where you can choose to be notified by e-mail, Facebook, Twitter, or RSS Feed the moment an amazing travel deal from Edmonton is found. * crowdsource the best travel deals from YEG?